Here’s a book – in fact a series of books – that deserve to be much better known, at least in the UK. Ernest and Celestine, the creation of the Belgian author and artist Gabrielle Vincent, are a musical bear and his adopted daughter, a sensitive young mouse. It will appeal to anyone whose enjoys the work of Clara Vulliamy or fell in love with the Bear and the Hare adverts last Christmas. The stories are all about the parent child relationship, a bond that becomes stronger and stronger with every passing adventure. 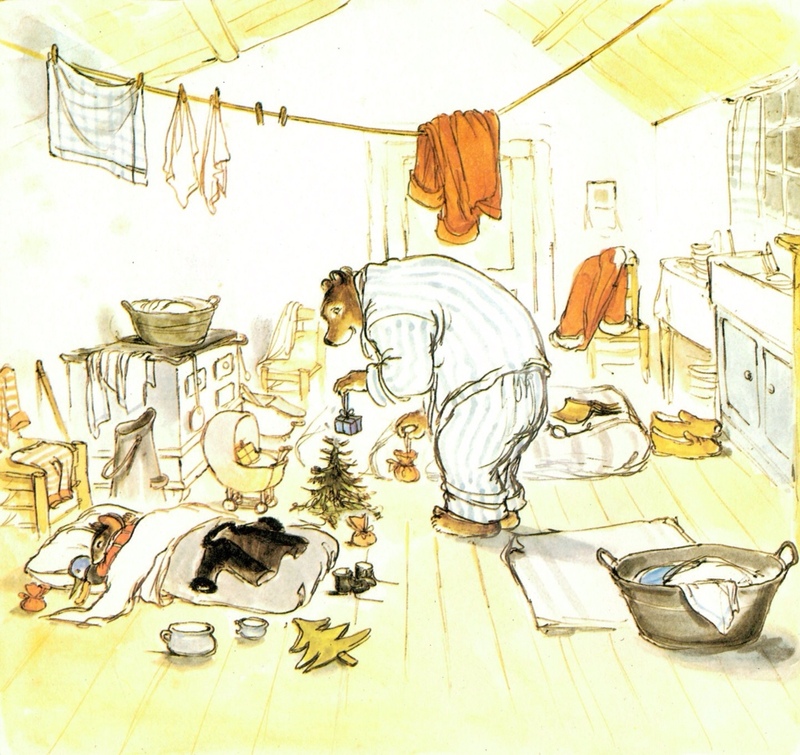 Although they are animals, this feels as authentic a depiction of family life as any Shirley Hughes creation. The artwork captures every emotion, even in the most nuanced expression. Vincent like Beatrix Potter or Arnold Lobel is a master in the anthropomorphic arts. 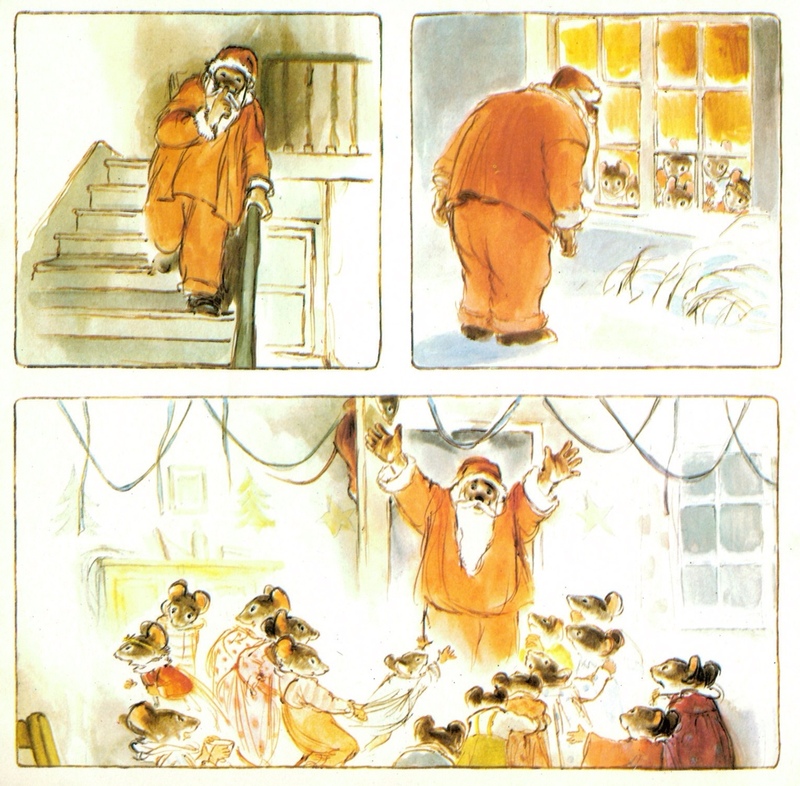 The opening scene in which Celestine reminds Ernest of his promise of a Christmas party is a masterclass. The background shows the fun and games going on in the snowy park, but all your attention is on the interaction between the bear and mouse. Like the boy in the Fry’s chocolate ads, Celestine runs the entire gamut of emotions, entreating, arguing and sulking as Ernest attempts to explain that they are too poor to throw a party. Of course Celestine wins out, and they embark on creating the best handmade Christmas party ever. It’s Ernest though who is in charge of the heavy work. They transform their draughty, shabby, house into a warm, candle lit grotto. The party thrums with excitement. 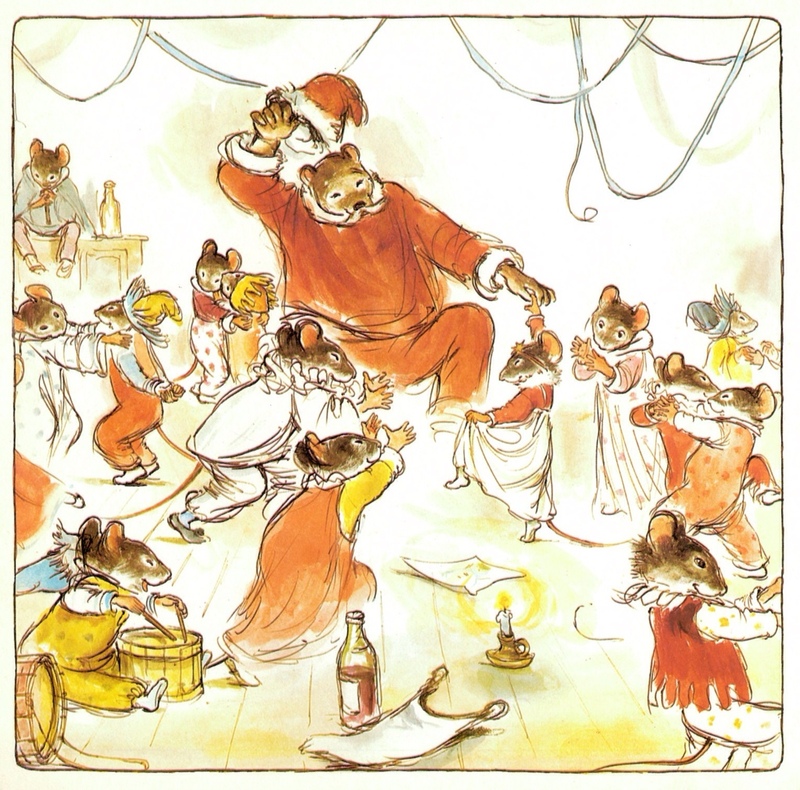 Music jumps off the pages in the second half of the story, as Ernest comes into his own, as a fiddle playing, singing and dancing Santa bear. The spirit of carnival engulfs all of the guests, who fill the room with gay abandon; chairs, crockery and the Christmas tree are all thrown to one side to make for the fun and games. 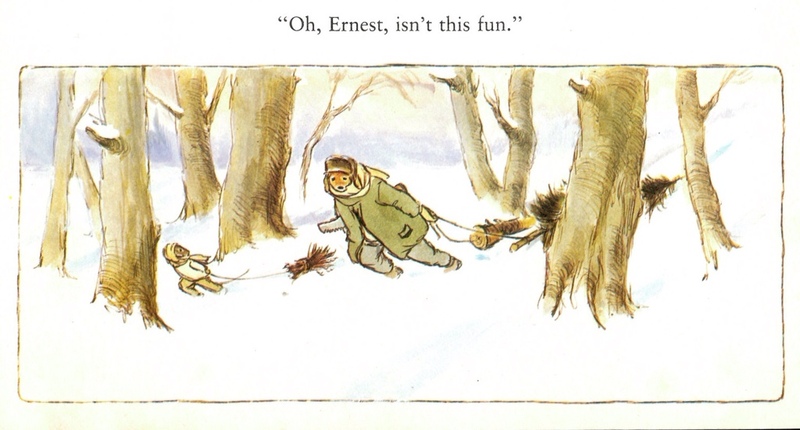 There’s so much joy to be found in this book – and in the 2012 film which expands the social context behind Ernest and Celestine’s unconventional relationship. Tags: christmas, Ernest and Celestine, Gabrielle Vincent, handmade. Bookmark the permalink. I really want to read more of the Ernest and Celestine books, thank you for showcasing this one. I found a few in a remainder bookshop a while back (lovely hardback editions) but only let myself buy one, wish I’d got a few of the other titles too. Agree that they should be more widely known.